Truth is affirmed by facts. Truth is most clearly understood in terms of “what” and “how.” These questions are generally the domain of science. “Who,” “when,” and “where” are generally the domain of history, and history is sometimes less certain because it depends on the written records of those who were present at the time the events were taking place. “Why” is largely the domain of philosophy and is the least certain of all disciplines. Assuming that we are making a conscious effort to comply with biblical guidelines for our lives, we are all instructed to “do business” until the Lord returns (Luke 19:13). Some of God’s twice-born are specifically called into a ministry field, but many more are called into professions that require other specialized training—thus, the need for further education. Although the Bible does not provide a specific test for prospective educational institutions, there are several broad applicable guidelines for any decision that would expose our minds to information. The Christian world overflows with schools and seminaries that teach the particulars of the Bible. 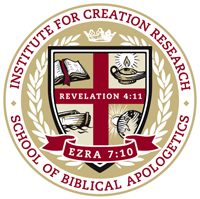 So why did the Institute for Creation Research open its own apologetics school in 2009? For the simple reason that ICR offers an emphasis that is sadly missing in many Christian educational institutions these days—a commitment to biblical creation tenets. America’s evolution-creation controversy is like a lawsuit over a probate estate. The evolutionists are “contesting the will” of the founding fathers of modern science, but so far they are only winning the estate’s furniture—as an example from Puritan New England will illustrate. The ICR School of Biblical Apologetics offers periodic ACSI-accredited CEU in-service opportunities for ACSI teachers and administrators. Now you can obtain continuing education credit from an organization dedicated to upholding the authority and accuracy of God’s Word. Not only that, you’ll receive biblical and apologetics training that will aid you as you minister to students and colleagues.